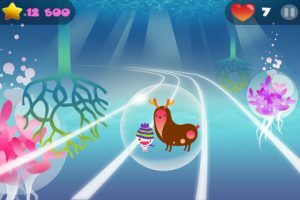 Go Go Woony, developed by Extra Liveis an iPhone game that feels like the trippy second cousin of games like Katamari Damacy, but with an old-school arcade racing twist. 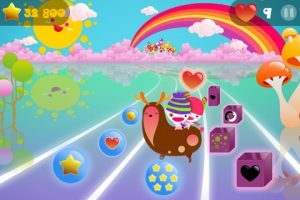 Despite it’s cutely funkadelic vibe, this iPhone game is definitely appealing to kids and adults alike. 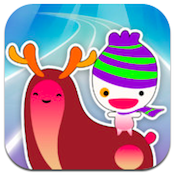 Your goal in Go Go Woony is simple: help Woony to reconnect with Moony, his gal pal. To that end, you’ll be racing across three different worlds (Sky, Earth, and Ocean), as well as 30 separate levels. While the music won’t be everyone’s cup of tea, it’s easy enough to ignore. The real star of Go Go Woony is the unique graphic style. The graphics not only look cool, but have great stability during the ultra-fast-paced racing segments of the game. 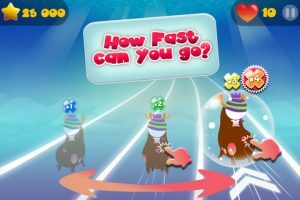 In addition to moving as fast as you can to reach the finish line, you also need to collect powerups, avoid obstacles, and even try to slalom to reach your eventual goal. The variety of atmospheres and obstacles in your path keeps the gameplay fresh, though prepare to be frustrated in some levels: the fast pace of the race is sure to make you look like a disgrace…at first. The most important part of any racing title is the ability to control your character easily and accurately. Thankfully, the controls in Go Go Woony are highly responsible, which ensures that you keep on having fun with the game. There’s also a tremendous amount of replay value, thanks to all of the achievements you can track down. If you want an iPhone racing game that’s cute and challenging, Go Go Woony is it. Go Go Woonyis compatible with iPhone, iPod touch, and iPad. Requires iOS 4.3 or later. Note from the developers: iPod touch 3rd generation 8GB model is not a true 3rd generation device, so the game isn’t compatible with it.A small expedite fee was paid by the developer to speed up the publication of this iPhone game review.